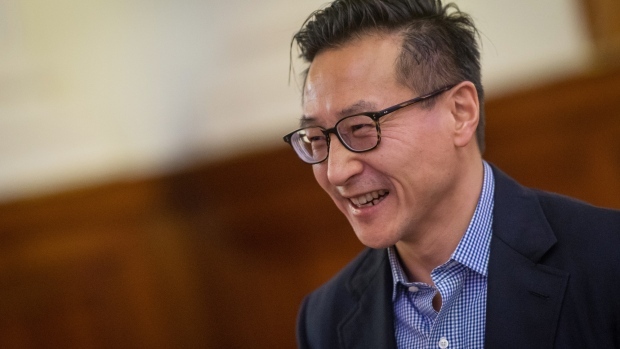 (Bloomberg) -- Alibaba Group Holding Ltd. Vice Chairman Joseph Tsai said the e-commerce giant has experienced limited impact from China’s broader economic slowdown as more and more business moves to the internet. “Our business is delinked” from the Chinese economy because “we’re in e-commerce and we’re digitizing the whole sector,” Tsai said Tuesday at the Goldman Sachs Group Inc. technology conference in San Francisco. Tsai said the company’s growth would continue to outpace the broader economy as digital commerce expands faster than the traditional retail business. China’s economy expanded 6.4 percent in the last three months of 2018 from a year earlier, according to the country’s National Bureau of Statistics. Alibaba’s revenue rose 41 percent to 117.3 billion yuan ($17.3 billion), though that was the slowest pace in more than two years. While the Chinese economic deceleration is depressing the consumer demand it relies on, the company’s been spearheading a drive into lucrative new spheres such as cloud services and entertainment, while helping modernize physical retailers. Tsai compared Alibaba’s situation with Amazon.com Inc.’s ability to achieve consistent double-digit sales growth while U.S. economic expansion is projected to slow to about 2.5 percent this year. He also praised China’s decision to reduce the tax burden for small and micro-sized companies by 200 billion yuan per year for the next three years, to boost those businesses amid the economic downturn.